Yes folks that’s the fourth oasis class cruise ship now under construction, Once it’s complete we’ll have four of the worlds largest vessels sailing the oceans. Royal Caribbean and STX France have made a huge milestone by cutting the very first piece of steel for the cruise lines fourth oasis class ship. 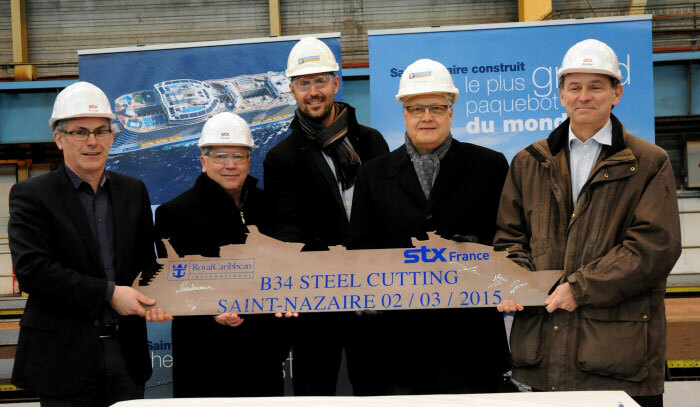 the steel was cut at the STX France shipyard in Saint-Nazaire, France which is also the same as the cruise lines third oasis class ship. The 4th ship will be completed by 2018 and until then Royal Caribbean will be releasing more details about both upcoming vessel overs the coming months. The names have yet to be chosen and all the onboard features have yet to be revealed so there are lots to look forward to. What we do know is that the new ships will be at least 225,282 gross tons and spanning 16 decks with 2,700 staterooms. The ships will be a similar design to Oasis and Allure but we expect to see something new and innovative which Royal Caribbean are well-known for.